Incident Details: A young and inexperienced couple from overseas took to the hills to cover the route from Rosthwaite to Grasmere, totally under-estimating the length of time it would take. They were very poorly equipped for the task, and were overtaken by darkness somewhere around the top of Greenup Edge. When they rang for assistance, they believed they were not far from Grasmere, but above a steep drop. Kendal MRT, who were covering for Langdale MRT, mounted a search from Far Easedale, and asked for the assistance of Keswick team, following a request for Search Dogs. 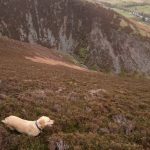 Three of the Team’s dogs were able to attend, and a small number of Team members and the dogs searched Wythburn, Steel Fell and the path up from Rosthwaite. It was this last group that came across the couple on the footpath, who were cold, wet and dispirited. They were escorted down to Fairy Glen, and then were given a lift back to Ambleside, having been offered some advice about equipment and navigation. It appeared that they had walked round in a circle, and ended up on top of Eagle Crag. There are occasions when Google maps are really useful – but this really wasn’t one of them! 9 Team members – 4 hour 10 minutes.